Self-administered pension arrangements allow an investor identify and acquire specific investments including property. Pension Rules allow the use of retirement funds for the purchase of real property assets in individual, co-ownership, or syndicated funds. Properties held fall under the categories of residential, commercial, industrial, or may be a combination of each of these held within syndicated funds. Reasons to invest pension in property. You can pick the property you wish to purchase with your pension, residential, commercial, and industrial or a combination of each can be held with the fund. Income tax relief on contributions made to fund the purchase are at the higher rate of tax. There is no income tax on the rental income and no Capital Gains Tax (CGT) on the eventual sale of the property. Upon retirement, you can take 25% of the value of the pension fund as a lump sum, of which €200,000 is tax free. The property can transfer in specie to a self administered ARF and the rental income can contribute to your income in retirement (draw downs are subject to PAYE). You have control over every aspect of your pension. If available, gearing can be used to assist in purchasing the property. If you are purchasing a commercial property the fund can be registered for VAT if required. How can I purchase a property through my pension? Contact Harvest Financial Services to discuss your current pension arrangements. We will help you organise to have funds in place in your pension. 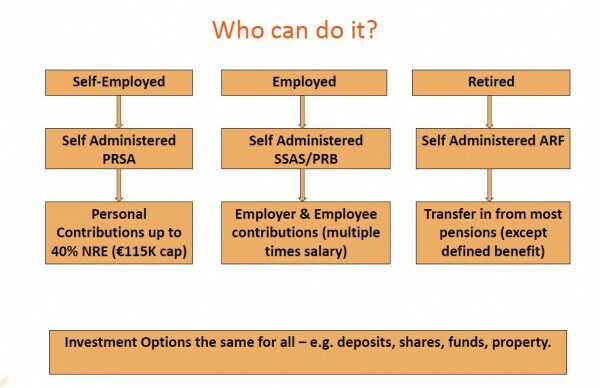 Transfer existing pensions in to a self administered pension (where appropriate). Personal Contributions, restricted to a percentage of NRE cap €115K. Company Contributions – your company/employer can contribute to a pension on your behalf. Are there restrictions buying property through pension? The vendor must not be related to you, your employer, it’s directors and associated companies. The property cannot be sold or let to relatives, your employer or its directors and associated companies. Personal use of the property is prohibited. The development of a property with a view to its disposal is not allowed. Can I borrow to fund the purchase? “Limited Recourse” – the lender can take security over the property only. Maximum loan term of 15 years or NRA if sooner. Subject to bank’s lending criteria. The pension scheme cannot borrow retrospectively. Banks currently looking at commercial property with strong lease covenant and residential property in urban areas (10,000+ population). Advantages of Investing pension in property. Generous tax reliefs on funds to purchase property. All purchase costs are met by the pension. Rental income is exempt from income tax, PRSI and USC. There is no Capital Gains Tax on the sale of the property. You can transfer the property in specie in to your Approved Retirement Fund (ARF) at retirement. Disadvantages of Investing pension in property. You cannot use the property – it must be for investment only. Risk – Gearing significantly increases the risk profile of the investment. It is an illiquid asset. How do I find out more about Investing in Pension in Property? To find out more about investing your pension in property and to determine if they are suitable and appropriate for your portfolio please call us on 01 237 5500 or email justask@harvestfinancial.ie. The particular tax treatment contained herein is based on Harvest Financial Services Limited’s understanding of current Revenue practice as at November 2017. Please note that the tax treatment depends on the individual circumstances of each client and may be subject to change in the future. You should take such independent tax advice as you deem appropriate.